Genealogists deal with all kinds of family information each and every day. Including, of course, family secrets. Some of them are laughable to us today: the 18th century court record showing an ancestor getting into trouble or the 19th century couple whose marriage preceded the birth of the first child by a lot fewer than nine months. But many of the secrets we encounter, particularly in this day of DNA testing, can impact living breathing people. Sometimes people we care for. People we love. People we don’t ever want to hurt in any way. And so we struggle, at times, charting our way through the ethical waters. How do we know what’s right to do as genealogists? 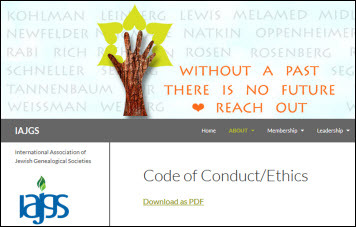 And, now, there is a newly-updated Code of Conduct/Ethics from the International Association of Jewish Genealogical Societies (IAJGS) we can all consult for additional guidance. • While understanding the privacy concerns of both the public and governmental agencies, the IAJGS will continue to advocate for access to all records relevant to genealogical research. Individual genealogists should respect requests made by persons asking that certain information about themselves or family members be kept private. • More recent data should be evaluated in the light of sensitivities of the living versus the importance of disseminating information. All of these resources can and should be studied to help us make good, sound, caring, ethical decisions in what we share and what we reveal in the course of our genealogical research. There are times when you publish an article that seems as though you read my mind. This is one of those articles. Timely. Thank you. Obviously well intentioned but squishy. The guidelines don’t say more than “be nice”. Hard to hang someone for violating them (akin to congressional ethics rules – “whoops, no one ever told me not to do that.) I guess it’s hard to be more specific, and they do leave a little positive nagging in you mind. This isn’t law; it’s ethics. Wiggle room is necessary, and nothing takes the place of the tool between the ears. Thanks Judy for providing us with guidance and the words to share with others. Yep, the tool between the ears and the one in our chests that share empathy. I’d like to hear comments on how folks would handle the living descendants of a woman who, I recently found, was born to another man than the one they think is their ancestor. The knee-jerk reaction was to threaten to sue me if I publish this information. The man who gave his surname to sixty years of family reunions was the social father, not the biological father. The descendants are hoppin’ mad. It felt right to me to lay out my evidence (for them only at this point) and give them some time to get used to the idea. What would you do? My line-in-the-sand is always living people: how does this impact real live living people? If the person objecting was the child born to another man, I’d honor her wishes. Her own personal involvement in the story is enough for me. These descendants sound they couldn’t be more closely related than grandchildren to the man or children to the woman, and at that point I start to think that they need to realize this has nothing to do with them in terms of shame or the like. Being the grandchild of people who fooled around seems to me to be no big deal, and folks ought to be able to see the humanity — and the humor — in their full family story. I certainly don’t think there’s a court in the country that would say this was actionable if it were published, but these days you never can tell. And there’s the rub: “folks ought to be able to see . . . ” Thanks for insight, Judy. Thanks, Judy – great post. I have discovered many interesting things during the course of my research that I have referred to on my blog in general, rather than specific terms. Much of it is several generations back (like my 2x great-uncle who appears to have contracted a bigamous marriage as I can’t find a divorce record), but I still don’t feel it’s something I should make public with specifics. Would my distant cousins care? I have no way of knowing, but for now, feel that discretion is best. It was difficult enough telling my mum that her maternal grandfather did jail time for fraud-related crimes twice. All of us face this issue from time to time. Me, my line in the sand is the living: if the person I’m writing about is living or the living child of that person, I want permission before I go with it. Back beyond that, I tend to think we need to have a thicker skin — and a sense of humor. OMG, I got one for you. I was adopted at birth. I found my biological families on the genealogy sites because I found my adoption papers in the house and it contained my bio parents’ names. I found out that my paternal g-grandfather was a murderer and a horse thief! I wasn’t shocked or offended. He also had a bevvy of wives that made it difficult to tell which kid belonged to which wife. My own adoption was due to a frisky father who was already married with kids and an underage mother. For god sake if you can’t see the humor in that you must be pretty sad. I figure he’d roll over in his grave if he knew his g-granddaughter worked serving law enforcement! However, even though my bio father’s wife was still living at the time, I did not attempt to contact my half sibs. The rest of the extended family on both sides accepted me with open arms. It’s a commonsense and empathetic thing if you ask me. Think of all consequences before opening your mouth (or sending an email). There’s always a work-around. Coming late to this discussion. Lacking consent from mentioned people, can the author of a genealogy publish the names of living people? I assume that no other information (including birth place, date, etc.) would be shown. I wouldn’t, personally — think about all the times the person’s mother’s maiden name is used as an identifier and the fact that this gives away that identifier.